2016 is also the first year of the implementation of the new Sustainable Development Agenda 2030, (SDGs). 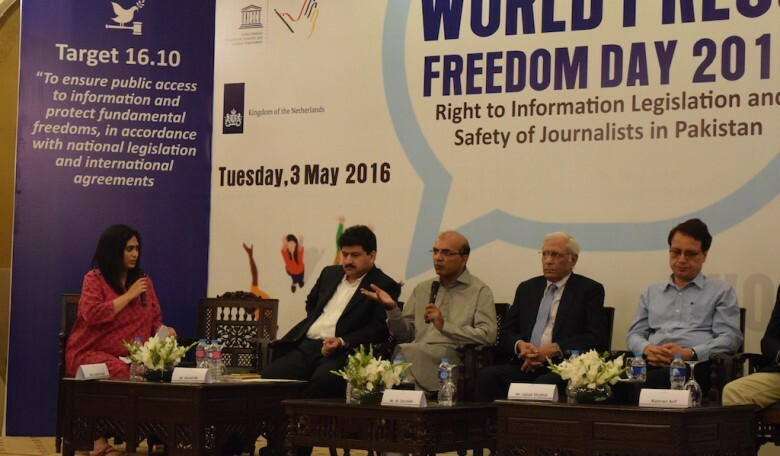 This year’s event in Pakistan focused on two burning issues related to Press Freedom. 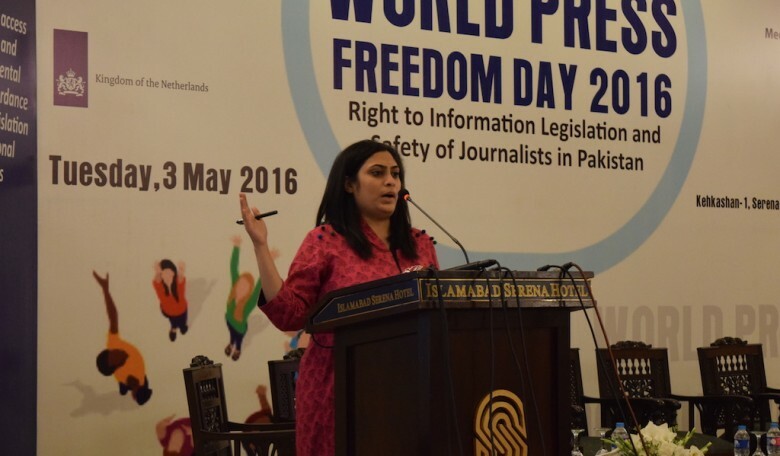 First, the Right to Information Legislation (RTI) in Pakistan, in particular, the lessons learned from KPK and Punjab, and second Safety of journalists, in particular, an analysis of the role of media houses in advancing the safety of journalists’ agenda and Journalists Protection and Welfare Bill possible adoption. 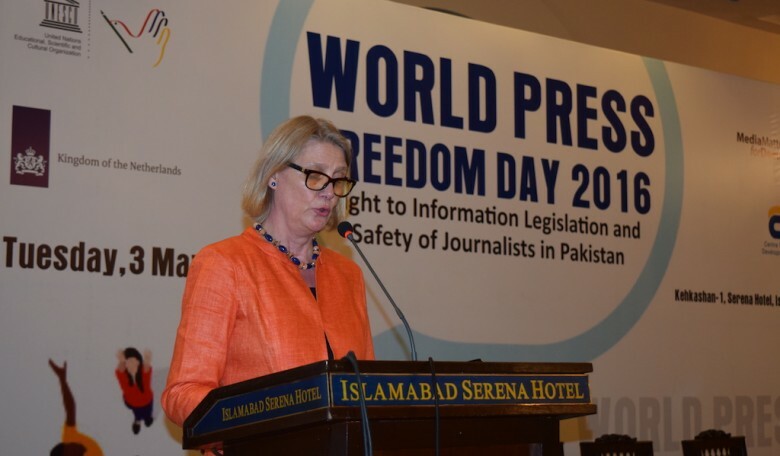 The event titled “Right to Information Legislation and Safety of Journalists in Pakistan” was organized by United Nations Educational, Scientific and Culture Organization (UNESCO) to Pakistan with the Embassy of the Kingdom of the Netherlands, Media Matters for Democracy (MMfD) and Centre for Peace and Development Initiatives (CPDI). A Technical support was also offered by Foundation Open Society Institute-Pakistan and United Nations Information Centre Islamabad. 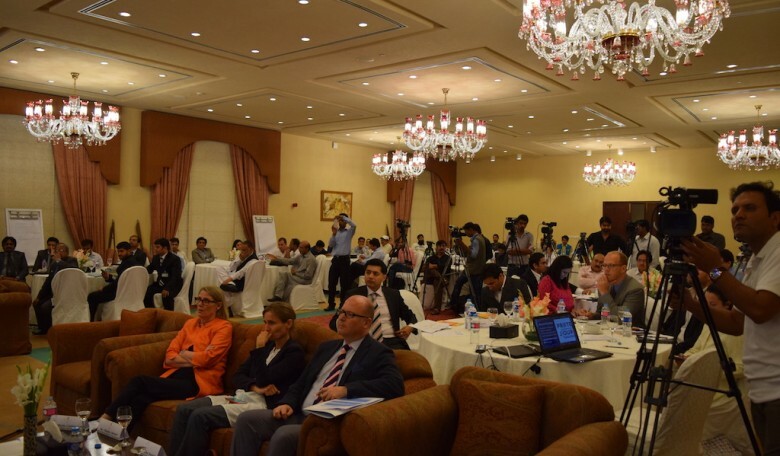 Following two morning workshops focused on seeking recommendations and attended by 30 participants, an official opening was held by UNESCO representative to Pakistan, Ms. Vibeke Jensen; Ambassador of the Embassy of the Kingdom of the Netherlands to Pakistan, Ms. Jeannette Seppen and Parliamentary Secretary for the Information, Broadcasting Secretary and National Heritage Ministry, Mr. Mohsin Shah Nawaz Ranjah. 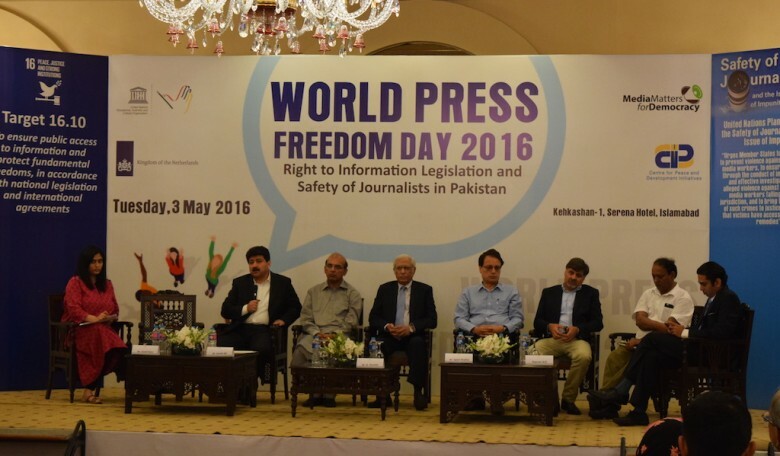 As the formal opening was held in the afternoon with the presence of 113 participants, including representatives of the embassies, civil society, United Nations sister agencies and media, a panel discussion compromising senior journalists took place after the opening to highlight the main issues facing Access to Information and Safety of Journalists in Pakistan. Senior journalists, lawyers, governmental representatives from the Ministry of Information, Broadcasting and Cultural Heritage and civil society experts in the fields (Detailed list hereinbelow) discussed the actual status of the Federal Right to Information bill and the lessons learned from Punjab and Khyber Pakhtunkhwa Right to Information laws. The working group also discussed the importance of promulgating a Right to Information law at the Federal level and other provinces in Pakistan: Sindh and Baluchistan. In order to develop Right to Information laws that are relevant to the Pakistani context, The Ministry of Information, Broadcasting and Cultural Heritage should involve practitioners in the deliberative process. Information should be proactively disclosed by government departments as necessitated under section 4 and 5 of the Punjab and KP RTI laws. The legislation should include the State relocation of journalists under severe threats; the relocation verification should be dealt with through the Commission formed under this Bill, in consultation with PFUJ and other bodies like CPNE. The legislation should ensure the protection of journalists according to international standards and include the provision of life insurance and safety equipment especially for those working in conflict zones. The legislation should define a mechanism to deal with the abuse of power by any authorities. The working group did not reach an agreement regarding the exact process of ensuring such protection or mechanism and thus it requires further deliberations. Senior journalists and experts on Right to information law raised the main issues that Journalists and Media workers are facing today in Pakistan. 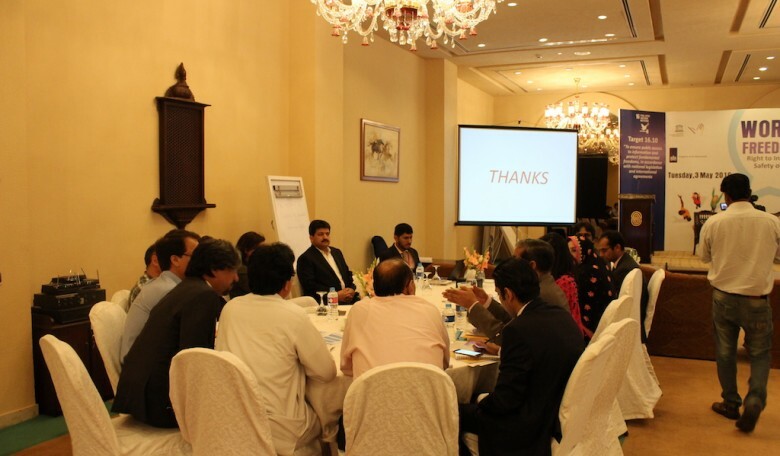 Mr. Hamid Mir, the Senior Journalist, alerted about the danger of impunity and highlighted a large number of killed journalists since 2000 in Pakistan, estimated at 115. According to Mr. Mir, the national interest should not be discordant with the public interest and the protection of the public interest is a duty of each journalist. He also stressed the alarming media index given by Reporters Without Borders indicating that media censorship is increasing in Pakistan. Mr. Muhammed Ziauddin, the Senior Journalist, agreed with Mr. Mir’s opinion and underlined the problem of self-censorship widely practiced by the journalists. He highlighted the critical situation of the journalists in Balochistan, Federally Administered Tribal Areas and Karachi where journalists are attacked by different actors including extremist groups. He considered that the main role of the journalist is to watchdog but since the situation is such the role is hard to be accomplished. The media industry, according to him, is also facing some internal difficulties which makes it very hard for someone to work in this field these days. Mr. Mukhtar Ahmad Ali, Information Commissioner on Right to Information from Punjab, explained that it is hard to change the culture of secrecy, media sector is the most affected by this matter but this culture should be changed. However, Pakistan succeeded in including the article 19- A in the constitution and Punjab and Khyber Pakhtunkhwa Right to Information Laws are among the best in the world. In Punjab for example, more than 2000 complaints were registered and around 1500 were resolved, the Commission disclosed various information of the high-level authorities, and however redundancies in the laws should be removed. Mr. Zahid Abdullah, Program Manager at Centre for Peace and Development Initiatives expressed his concern that the Government appears to be on the verge of making amendments in a draft of Federal Right to Information Bill, that has been rated very highly by experts, under the pretext of security concerns. Mr. Abdullah was of the opinion that the draft should be tabled in its current form, without amendments, as it already offers ample cover to protect any information that might result in a security concern. Mr. Yasser Hamdani, an independent lawyer, when asked about the possible challenges while drafting the Journalists Safety Bill, explained that the most difficult part would be to ensure a balance between freedom of expression and journalist security. Any legislation related to the media has the potential to have an impact on media freedoms so, this bill would have to be drafted very carefully and ensure that there are no mechanisms that would create the space for undue state intervention. Mr. Kamran Arif, Co-Chair at Human Rights Commission Pakistan also explained that despite the tense security situation in Pakistan, a state of emergency has not been declared and Pakistan still has to abide by its international obligations. Thus any legislation or policies that compromise fundamental rights, including the right to information and freedom of expression are not constitutional and have no legal cover.